In FIRST Stronghold, alliances of 3 teams try to deliver gears to their airship and shoot fuel into their boiler. Teams deliver a gear by placing it on a peg that will then be pulled up onto the airship by the human players. On the airship, there are 4 rotors which all need a different amount of gears needed to get it spinning. They spin by having the human player sequence them together on the edge of the airship and spin them until the rotor is also spinning. Once the team has a rotor spinning they get points. Shooting fuel into the high and low goal will also earn you points. In the final 30 seconds of the match, your team's human players can deploy your team's rope from the airship, and you can climb it for additional points. We were chosen as the third pick for the seventh alliance in elimination matches! 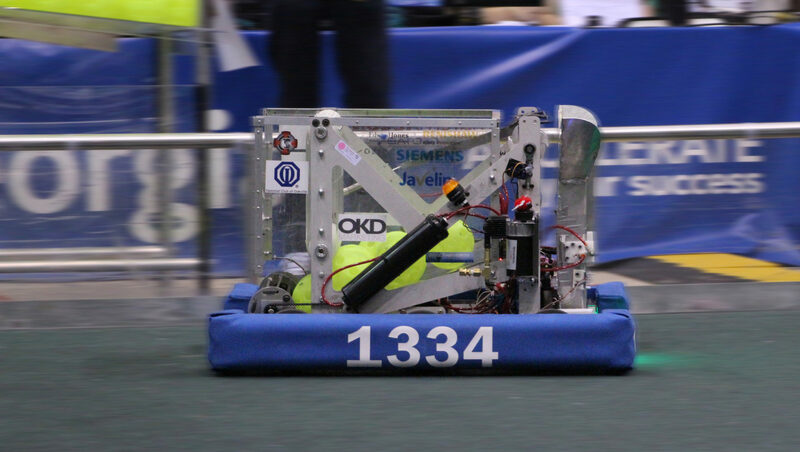 We are very grateful to alliance partners, teams 2994 and 4946 for choosing us! Our alliance played very hard but unfortunately, we were eliminated in a final, tie-breaking match in the quarterfinals. This competition we were the alliance captain of the seventh alliance and we chose teams 2702 and 1310 to join us. It was very hard fought quarterfinal matches but unfortunately, we were eliminated in a tiebreaker match. Although our team did not qualify for the Ontario Provincial Champs held at the Hershey's Center in Mississauga, some of our team members went to check out what it was like. It was a very exciting atmosphere with very high scoring matches. Hopefully next year we are able to go!